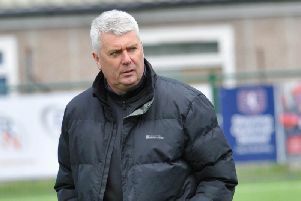 Gerry Murphy has refused to set his title chasing Steyning Town side a points target this season, but simply told them - keep on winning. Town, who gave lost just twice in the league all season, moved five points clear at the summit of the Division 1 table courtesy of a 3-1 triumph over Wick at The Shooting Field on Saturday. They came from a goal down with strikes from Grant Radmore, Lewis Levoi and Alfie Gritt to clinch victory over a side under the caretaker charge of Dan Cox and Luke Cooper. The Barrowmen boss Murphy revealed that he and the team had a midweek meeting ahead of the clash to make sure they were all pulling in the right direction in the title and promotion race. He said: “Our overall performance was not so good and I feel we have dipped a bit of late but still being top is great. It was good to come from behind to win. “There is no magic target in terms of points but if we can keep winning its in our hands. It was not the start that Town wanted though as Shane Brazil’s strike inside three minutes put Wick ahead. Radmore twice went close, before Town levelled on 29 minutes when Rob Clarke crossed for Radmore to head home. Just before the break, a Josh Maher cross from the left found the head of Alex Gathern, producing a superb finger-tip save from Wick keeper Keelan Belcher. Four minutes into the second half, Levoi slotted home from close range after some neat work from Gritt. Town didn’t look back from there and on 67 minutes, Gritt cut in from the right to blast home and make the points safe. With with Bexhill and AFC Varndeanians drawing 1-1 and Alfold also dropping points, it capped a fine weekend for Town. Steyning travel to Sidlesham on Saturday. Town: Banasco-Zaragoza, Clark, Maher, Parazo, Levoi, Gathern, Bull, Hunter (Thompson), Radmore (Sabino), Faber, Gritt (Bacon).